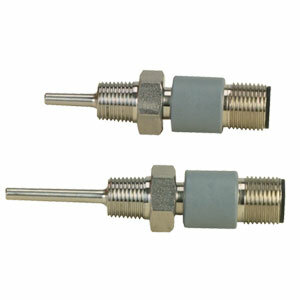 This RTD plug sensor is ideal for pressure vessel applications, pressurized containers and applications requiring a temperature sensor with an NPT mounting fitting. The single element design has a 1/8" diameter, 316 stainless steel probe that extends 13 mm (0.51") or 24 mm (0.94") from a 1/8 NPT mounting thread. The M12 connector assures a very reliable connection. Extension cables are offered in different lengths with right or straight angles.